Greensboro. Serving select employee groups in Greensboro. Repossession agency based in Greensboro, North Carolina. Greensboro agency represents women and men for print, catalog, editorial, and commercial campaigns. Business profile, philosophy, services, biographies, photos and contacts. Located in Greensboro. Provides accounting, tax, and management advisor services in the Greensboro and High Point areas. Commercial, advertising, fashion, still life, digital imaging, catalog, and corporate. Greensboro, NC. a ltl and tl carrier providing service to the east coast and the los angeles area. located in greensboro, nc. Offers residential financing. Features products, company profile, news, online application. Offers 24 hour air conditioning and heating service. Information on company and services. Greensboro, North Carolina. provides owners and operators of cessna citation aircraft with management and technical services. company and service details. greensboro, north carolina, usa. Sales and service of compressed air breathing systems, located in Greensboro, North Carolina. Located in Greensboro, North Carolina, specializing in the placement of professionals in the apparel, textiles, retail, pharmaceutical, IS and IT, sales/marketing, and transportation fields. Offering quality photography and video for weddings and special events in the Greensboro area. Specializing in technology and international advertising, with offices in Greensboro, NC, and Bochum, Germany. Member of the Biotech Marketing Alliance. Specializing in children, family portraits, and school pictures. Includes photographer profile, gallery, photo session tips. Based in Greensboro, NC. Providers of emergency services and restoration following large scale damage events caused by natural and man-made disasters. Home office in Greensboro, with affiliate offices elsewhere. tl common and contract carrier, serving the eastern u.s., texas and canada. online application form for owner-operators. located in greensboro, north carolina. freight hauling in north america. information about the airline, its equipment, capabilities and location. greensboro, north carolina, usa. Corporate, professional and personal coaching. Realize potential, achieve goals and make better decisions. Greensboro, North Carolina. Based in Greensboro, NC. Specializing in weddings, bridal portraits, engagements, children and family portraits using color or black and white. Will travel. Providing design services and antiques for family homes, offices and clubs. Includes profile, firm history, services, portfolio and contacts. Located in Greensboro. greensboro, north carolina, united states. light to medium duty towing and recovery service, roadside assistance, local and long distance transport and complete auto repair. Speaker reconing and repair from automobile stereo speakers to professional public address systems. Located in Greensboro, NC. 43 BGF Industries Inc. Greensboro, NC. 44 BGF Industries Inc. Greensboro, NC. Offering a full selection of cameras and equipment plus technical support. Greensboro N.C.
Greensboro-based store sells paintball supplies and gear, hosts forum, and publishes links. On line pricing and services resource for marketing, photography and the arts. Specializing in photoprocessing, digital imaging and quantity reproductions. Serving business communications via mail order. Greensboro, NC. UNC-Greensboro team coverage, statistics, scores, standings, transactions, injury reports, schedules, and rosters. Official site of the Greensboro, North Carolina Grasshoppers minor league baseball team. Schedule, roster, statistics, ticket and merchandise information, and message board. A place for Greensboro hockey fans to talk hockey, whether it be Generals, Hurricanes or teams of the past. Part of the Greensboro Sports message boards, a fan forum dedicated to Generals fans. Team-branded e-mail, news, information, players, schedule, coaches, photographs, and links. A GYSA/Triad Challenge League boys team located in Greensboro. Judo and Jujitsu club in Greensboro, NC. Club and Judo-related news, information, and resources. 59 USA Today - UNC-Greensboro Spartans Schedule/results, roster. Offers laser vision correction in Greensboro. Meeting lists provided. Also explains what AA is and gives local service activities. General information, hours, events, and directions. Greensboro, North Carolina. Provides a broad range of senior health care services. Serving the Greensboro area. Kennel located in the area of Greensboro, North Carolina and established in 1999. Provides an overview of the cheerleading and pep squads, the mascot, and also contains tryout information. Affiliated to USAF. Includes class schedule, instructors biographies and related links. Photographs, pedigrees, and an explanation of their philosophy. Greensboro, North Carolina, United States. Information, contacts, news, handbook, tournaments, links. Spartans. Pictures, related links, contacts, coaches, news items and roster. Cocker Spaniels with an emphasis on conformation. Home to several champions. Located in Greensboro, North Carolina. Working stock dogs. Photographs, genetic and breed information, history, and links. Greensboro. Spartans - official web site with news, schedule, roster, statistics. Offers a full-service network of long-term care facilities and services. Located in Greensboro. Official site with news, schedules, statistics and roster for Spartan softball. Spartans - official site with news, schedules, statistics and roster. Pictures of dogs in need of homes, news, information on the breed, and memorials. Greensboro, North Carolina. Spartan official site. News, schedule, roster, and coaching staff. A fan site with upcoming events, news, links, discussion board, general hockey information, and photos. Offers class lists, schedules, and tuition details. Located in Greensboro, North Carolina. Provides a gallery of samples, pricing, related links, guided hunts, and a catch and release program. Located in Greensboro. Fan site with pictures, rosters, news items, statistics, coaching profiles, past season summaries and related links. Information on this Greensboro facility, training and fitness programs. 93 Blew Bayou Greensboro, NC. Greensboro, NC. Practice information and location, classes information, dog profiles and a photo gallery. Dedicated to the adoption of retired racing Greyhounds. Located in Greensboro, North Carolina. Map, list of services, office hours, veterinarian information, and pet health information. Greensboro. Nine hole public course in Greensboro. Includes rates, club history, and membership information. Offers a Clinical Aromatherapy program that covers topics such as blending and application. Provides class schedules, essential oil fact sheets, and a glossary. In Greensboro, North Carolina. Small animal clinic in Greensboro. List of services, hours of operation, driving directions, and links. Contains various articles and links. Also information about the instructor and contact information for his school in Greensboro, North Carolina, USA. Specialists in dermatology, internal medicine, surgery, oncology, ophthalmology, radiology, and critical care. Greensboro and Charlotte. A non-profit Christian home for male alcohol and drug addicts who have completed a treatment or detox program and desire a structured environment to further their recovery. Located in Greensboro, North Carolina. Located in Greensboro, North Carolina. Offers instruction in the Tracys system of Kenpo, Shootfighting, Cardio Kickboxing, and Tai Chi. Features description of styles, upcoming events, and school information. Motorcycle dealership with two locations. Includes bikes, parts department, service area, events, and local Harley Owners Group (HOG) information. Provides mens basketball team statistics, recruitment reports, game summaries, news and a look at the conference standings. Contact information for Doberman rescue in the greater Greensboro, NC area. A private, non-profit treatment center committed to helping people who suffer from alcoholism and drug addiction situated in Greensboro North Carolina. Offering seniors independent and assisted living, nursing home with skilled nursing care conveniently located in a country setting, Greensboro. Greensboro surgeons who specialize in plastic surgery procedures including cosmetic, liposuction, breast, microsurgery, hand, laser, facial and general medical surgical reconstruction. Providers of cardiac, thoracic, and vascular surgical care. Biographies of the surgeons, information on the types of services they provide, contact information. The Pacesetters is a youth track & field club which competes in USATF meets. Buick enthusiast and author of 'A Guide to Buick Diecast and Collectibles' from Greensboro, North Carolina. A safety and environmental consulting firm specializing in OSHA and EPA compliance. Specialties include PSM/RMP and chemical safety, as well as customized OSHA/EPA compliance training. Greensboro, North Carolina. Web design, internet marketing, ecommerce, hosting, and multimedia development. Based in Greensboro, North Carolina, United States. Distributors of RightFAX Production Platform since 1995 in Hong Kong, Macau and China. RightFAX allows thousands of fax submitted from host applications via file scanning, LPD and TCP port. Provides search engine marketing services, keyword research and analysis, search engine optimization, submission, and reporting. Based in Greensboro, NC. Offers web design for country clubs, health clubs, and organized social club communities. Located in Greensboro, North Carolina, United States. Search engine optimization company specializing in search engine submission and promotion. Greensboro, North Carolina, USA. 141 USA Today - UNC-Greensboro Spartans Schedule/results, roster. The Greensboro News & Record and Public Library chronicle the 1960 sit-in movement with a timeline, photos, and voices of the participants. personal injury firm based in greensboro. Etta Spier BBG #372 - History, calendar, and BBYO explanation. Meeting information and contacts with brief overview of Soka Gakkai and Buddist philosophy. greensboro firm emphasizing personal injury and medical malpractice. greensboro immigration law firm. description of practice and information on common issues. offering services for criminal defense and family law from offices in high point and greensboro. greensboro attorney focusing on medicaid planning and division of assets. services for medical malpractice and personal injury from offices in greensboro and fayetteville. greensboro law firm, offering services for personal injury, malpractice, and workers compensation cases. greensboro firm focusing on personal injury, family law, workers compensation, and criminal defense. Meets on the 2nd and 4th Tuesday, 7:30 PM, meal at 6:30 PM. Officers, calendar, history, trestleboard and links. Based in Greensboro, North Carolina. Includes meeting and contact information, an event calendar and a newsletter. complete line of cemetery and funeral home equipment. located in greensboro, north carolina. greensboro law firm emphasizing personal injury, wrongful death, medical malpractice, and nursing home neglect. Playing Southern Gospel Music and teaching programs from Greensboro. Features program information, photos, ask the pastor, and a newsletter. Worship schedule, ministries, missions, sermons, staff profiles, map and location. offering dispute resolution services for divorce, commercial, construction, employment, and personal injury. offices in montclair, and in greensboro, north carolina. greensboro law firm emphasizing on personal injury insurance disputes, product liability, and construction litigation. Pictures of available cats and dogs, adoption request forms, volunteer opportunities, pet care tips, and events. Greensboro. serving the greensboro area including union point and crawfordville. information about their merchandise, services, facilities and current obituaries. Support for transssexuals, crossdressers, spouses. Features meetings, resources, links, newsletter archives. Meets in the Greensboro area. greensboro immigration law firm. presentation of firm and practice areas. Official Site for the Graduate, Alumnae and Professional Chapter located in Greensboro, NC. Greensboro - Group hatha yoga classes for all levels, weekend workshops and instructor profiles. Contains information for guests, undergraduates and alumni. offering services for elder law, estate planning and administration, and estate litigation, from offices in greensboro. immigration firm based in greensboro. a group of residents from greensboro, north carolina who actively oppose the building of a fedex hub in their area. a mans tribute to his brother fred, who was born in greensboro, nc, usa, but preferred san francisco. pictures and guestbook. 1953-2003. Lists alumni addresses, news, and profiles. This club lists images, directions, and events online. Riders is located at 5701 Randleman Road, Greensboro, NC 27406. Alumnae chapter founded in 2002 serving the greater Greensboro, North Carolina area. A new chapter in the civil rights movement with an overview and photographs. bringing over 25 years experience in geology, hydrology, geophysics and geotechnical engineering to pre-litigation investigations, litigation support, expert witness services and consulting. based in greensboro, nc. greensboro, nc fine art and framing gallery. features, concert listing, news and streaming audio out of greensboro. sculpture, drawings, and furniture design by greensboro, nc artist. A Greensboro NC acoustic singer/songwriter. Tour dates, CD ordering, and links. Rock band from Greensboro, NC. Site includes a gig schedule, profiles, photographs, and lyrics. 228 WUPN 48 Greensboro/Winston-Salem/High Point. Site contains biography, images, and audio files of the rock/pop artist based in Greensboro, North Carolina. Photos of The Who in Charlotte in 71. Also includes pictures of Pete Townshend and Keith Moon taken with Eric Clapton in Greensboro in 74.
greensboro, nc gallery of contemporary decorative art. Dance company and school. Patron and ticket information, season calendar and company overview. includes historical and textual analysis of the books, including 'the humor of the flashman papers'. Dinner and a Broadway play at the oldest dinner theater in the US in continuous operation. History, auditions, dining, and show information. Greensboro, NC. an all male acapella chorus that promotes barbershop singing, members of the barbershop harmony society. SiteBook Greensboro City Portrait of Greensboro in Maryland. 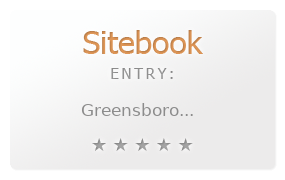 This Topic site Greensboro got a rating of 4 SiteBook.org Points according to the views of this profile site.